The FFI has already instructed to all State Floorball Associations as well as National Seminar Committee -FFI to conduct State Level Seminar for Referee & Coaches in all states, States are requested to contact immediately FFI-office or Mr. Thiyagu Nagaraj Secretary-FFI on his mobile no. 09965408000 and fix-up date, venue of the State Floorball Seminar for Rules & Regulations of the Referee & Coaches. The FFI is already going to announce National Floorball Seminar for Rules & Regulations of the Referee & Coaches in the month of Febuary-2008, States Florball Associations are requested to short-lists their name of participants for this seminar, please note that without having at least two (men & women) national referee & coaches state floorball associations will not be allowed to take part into coming National Championship. 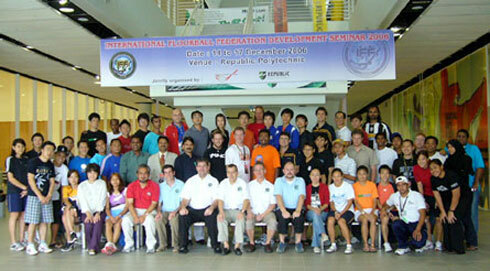 The FFI has made comulsory to all states floorball associations to conducts state level seminar within 2-3 months, the purpose is to produce (certified) referee & coaches for the state floorball associations, without certified referee & coaches floorball games can't be developed in the states and districts and played with IFF rules. The visitors are requested to visit frequently to this page , any moment, you can see the date, venue for National & States Seminars. ( Men & Women) at New Delhi. 15th National Coaching Camp for Floorballl & 5th National Floorball Championship ( Men & Women) at New Delhi. 1st National Floorball Festival at Ranchi, Jharkhand (Referee/Coaches/Camp/Invitation Tournament/Exhibition at Ranchi, Jharkhand - Jharkhand Floorball Association has been awarded by Floorball Federation of India the above Festival, which will be held from 17th to 26th May-2008, Any State Floorball Associations can take part into this festival. 1. Seminar for Referee’s/Coach’s by International Referee . 2. Camp for Floorball Player’s by International Coach . 4. Exhibition of Equipment and Photograph . Floorball Association of Delhi has been awarded by FFI to organize the 2nd National Floorball Seminar on Rules & Regulations for Referee's/Coach/Administrative from 28th March to 30th March 2008 at New Delhi. State Unit can send players minimum 5 boys and 5 girls) State Officials or Senior level Players of Floorball Game (1) Those who are interested with this game and regularly conducting tournaments. (2) Persons should have attended various tournaments of Floorball. After the Seminar the Floorball Federation of India will conduct examination for the participants, to assess their ability to conduct the tournament and to prepare the State Team for National Level Tournament. To view pictutes of the Seminars like; National, International, , kindly click on the below links. 1st National Referesher Seminar on Rules & Regulations of floorball for Referee & Coach-2007, Pune.